I would like to introduce you all to Greg! He is our newest member of the family who is a VERY fluffy guinea pig. Greg is around 12 weeks old and lives outside in a rather large 2 tier hutch. 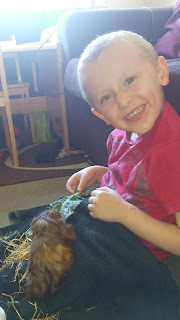 Our little boy has been asking for a pet for a while now and we really wanted to get him a pet as we thought it would teach him about caring for an animal. We couldn't decide what to get as a pet. Fish he couldn't hold, hamsters a little small, rabbits a little big but then we thought about a guinea pig and it seemed perfect! We did purchase 2 however one sadly passed away and as Greg is a male it would be difficult to repair him and therefore we now only have Greg. James has picked up really quick how to hold him and not to be to rough. He also helps to clean out the hutch every weekend and loves holding him and feeding him lots of veg and the occasional treat. 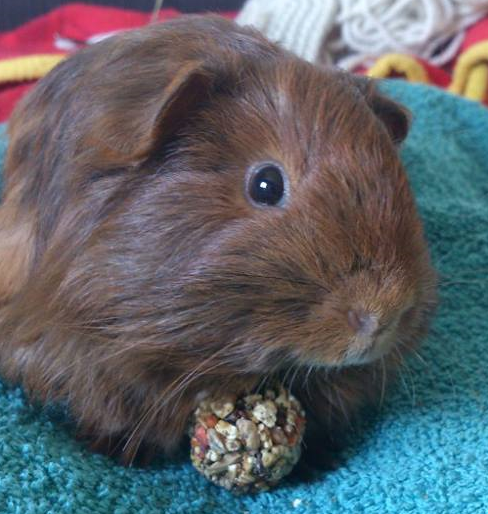 I can really recommend guinea pigs as pets if you are thinking of getting your little one (or yourself ) as a pet.